How and why digitalisation can revolutionise the 21st century utility. By Kala Vairavamoorthy and Will Sarni. Global water utilities are about to discover – as 19th and 20th century energy utilities already have – the disruptive force of an innovative technology. It wasn’t the threat any had expected. Nor is it one we can continue to avoid. In 1883, Thomas Edison had just launched the world’s first ‘power station’ burning coal to supply 59 customers. That same year, Charles Fritts invented a selenium semiconductor that converted limitless and distributed sunlight, without heat or moving parts, into electricity. The pioneering energy titan Werner von Siemens hailed this breakthrough as “scientifically of the most far-reaching importance.” But with 1 percent efficiency, high cost, no storage, and intermittent supply, photovoltaics seemed a negligible distraction to the established energy utility business model. Since then, energy utilities have largely been slow to embrace opportunities with solar. In the 1950s, solar conductors powered toys, radios and satellites. By the 1980s cheaper rooftop solar panels were linked to the grid. Today, solar shingles, film, and fabric are everywhere. Yet while the sun still only generates less than 2 percent of global electricity, it has begun to erode the rigid foundations of energy utilities. The fast-evolving skeleton and skin of solar technology has lowered solar’s price from US$200 to $0.30 per watt. Yet infrastructure “hardware” cost is only a small fraction of the answer. The real source of disruption has come through the “soft” inner nervous system that connects the sun’s energy to customers. Digital tools, internet-linked sensors, online algorithms, user-friendly analytics and handheld displays have combined to alter the connective tissue of how families and firms relate to their energy resource. Fast, frictionless and ubiquitous web/mobile systems have redefined the previously complex and invisible flow of energy into simple, clear, parsed and packaged data. As millions of urban consumers become energy producers – voluntarily choosing when to use, how much to store, or where and at what price to distribute their ‘current’– the stodgy old utility business model is being turned inside out. This new reality reframes how the traditional incumbent energy – and, now, water – utility is valued. Ready or not, digital tools have quite literally shifted power to the people. Notably, these digital platforms, algorithms and tools arise from entrepreneurs outside the industry coming from other sectors (e.g. the information and communication sector). They do not ask permission of regulatory agencies, elected officials, or prestigious trade associations. Nest, now owned by Google, did not check in with urban regulators before enabling people to schedule when best to run dishwashers, make ice, heat showers, or condition the air. It just set out to help countless customers affordably reduce their resource consumption in real-time. People can optimise the supply/demand profile on their own terms and timetables. That left energy utilities to adjust to these collateral impacts, or fail. Unfortunately, all too often the large entrenched interests have tried not to adapt, but rather to restrain the tide of digital technology. With economic roots going back to 1869, the International Hotel & Restaurant Association did not develop or embrace Airbnb any more than the century-old Taxicab, Limousine & Paratransit Association cooked up and welcomed the phenomenon that is Uber. Both enlisted political pressure to contain these brazen upstarts, fighting their spread block by block and street by street. Energy utilities have now engaged in a similar existential struggle, pressing regulators to let natural monopolies control the flow and price of electrons on the grid. Luddites of the Information Age face a losing battle. Technology, once introduced, can’t be shoved back in the bottle. Since analogue technologies can’t deliver current global needs for energy, water and other services, resistance to digital innovation is futile. It’s is also self-destructive, filled with wasted time, lost efficiencies and stranded assets. That is why the water sector must learn from other sectors to instead embrace the potential changes already underway. Utilities can, again quite literally, “go with the flow” of digitally-enabled demand and supply, working in partnership with new entrants to the world of water. Such an alliance could be mutually beneficial: water professionals often lack information technology skill sets and the perspective to appreciate what is possible, while technology entrepreneurs rarely grasp the nuances of complex water systems (which could actually be an asset). By collaborating, urban resilience will emerge faster and smoother; the most durable revolutions avoid bloodshed or razing institutions. The opportunity for digital water technologies is especially promising for water professionals in emerging economies. The cost of centralised water and wastewater systems can be prohibitive and as a result, emerging economies can develop and manage off grid and localised water systems from scratch, much as the competitive mobile (and now smart) phone access allowed billions of isolated individuals to “leapfrog” the old world of monopoly controlled fixed landlines. Dynamic and data-driven (as opposed to mechanistic) models can help integrate and optimise smart pumps, valves, sensors and actuators; each device can “talk” to each other, or for that matter to a customer’s iPhone, and send real-time information to be accessed and shared via the cloud. Against such mounting global tensions, the rise of digital water will prove transformational in making our sector more resilient for its customers as well as fuelling economic development. Acceleration is taking place in relation to less expensive yet more powerful microchips, software applications, automation, data storage, analytics, sensors, machine learning, artificial intelligence, and the dynamic complex of sensors and signals known as the Internet of Things (IoT). It’s easy to get caught up in the hype of so many emerging tools. Far more important is the trajectory and timeframe through which our often reluctant and risk averse sector learns to adopt and scale digital water solutions. There are larger forces at work. After all, digital water transcends urban utilities to potentially connect our water sector with related industries and resource issues, such as energy, health and agricultural production and ecosystems. What’s more, digital water solutions enable adoption of other innovative technologies such as off-grid and localised systems. The IWA Water-Wise Cities Initiative will ensure they are integrated early and often into urban planning and redesigning to build resilience in the face of the escalating need for water, aging assets and a changing climate. Already, we are helping incorporate digital water solutions that deploy remote sensing for flood prediction, and enable comprehensive hydraulic modelling, to manage stormwater runoff during extreme weather events. The water microgrid builds redundancy, identifies and buffers vulnerabilities and secures the resource supply chain in ways that improve clean water distribution, wastewater treatment, and stormwater management. Water professionals are often considered, rightly, to be conservative, cautious or late adopters. Yet several potent trends make digital water no longer optional, but rather inevitable. Will Sarni, CEO, The Water Foundry. First, stationarity is dead or dying. Water resource engineers were long trained that “natural systems fluctuate within an unchanging envelope of variability.” The past is no longer a guide. As global change brings local upheaval to decaying water infrastructure, water professionals must update our analytic strategies used for planning investments, with constant, real-time observations of water quantity and quality data. Second, water users are already profoundly connected. Digital technologies permeate our daily lives in ways that were unimaginable several years ago. Digitisation has accelerated the collection and dissemination of actionable information to all stakeholder groups including utility customers. Smart-sensing technology, utility web-monitoring portals, social media, gamification and AI chatbots allow water consumers greater access to information and higher rates of engagement. By “digitising the utility,” metered accounts can grow more involved and act on valuable knowledge on their usage, costs and conservation strategies. To be sure, digital water goes beyond the “demand side” of the meter. Connected utility assets help unlock the seamless integration of information and operational technology (IT/OT), creating “silent running” systems, innovations that improve water extraction through smart pumps, or treatment through real-time performance monitoring. A more connected workforce – using “smart” wear allows augmented reality and digital image recognition. Real impact in engagement and efficiency will come through the interaction of big data, clear analytics, smart devices and user-friendly applications. Finally, the dawn of digital water will enable a utility to seamlessly connect throughout its value chain. This extends from ‘upstream’ supply (basins, aquifers, potable reuse, desalination, or moisture capture) to ‘downstream’ utility operations and customers. What’s more, the utility “watershed” is also inextricably linked in a nexus with the equally critical energy “power-shed” and agricultural “food-shed’, sectors that compete for water thus need to align strategies and actions to ensure adequate resources to support urban growth. With digital water, IWA is developing the Basin- Connected Cities Action Agenda, which aims to harmonise urban, industrial, agricultural and ecological demands within a watershed. Done right, this approach should balance the delivery of all water needs and services collectively, while reducing our aggregate water foot-print. A digital systems strategy improves our understanding of – and decision-making capacity about — the complex interactions between competing water users, and can help articulate and allocate benefits (and costs) among sectors. 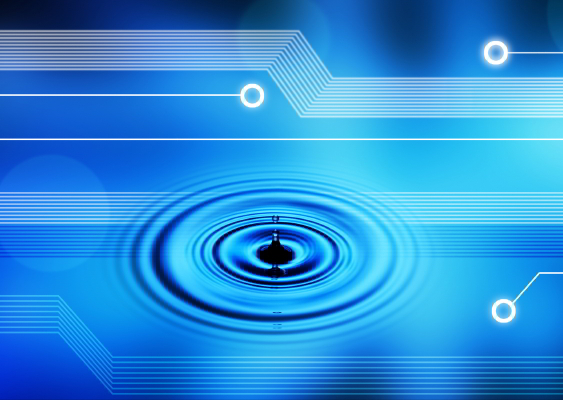 The water sector can learn vital lessons from how digital technologies disrupt other industries. The move to smart buildings, micro-grids and renewables in energy, for example, immensely improved the spread of cost- effective electricity in emerging and developed economies alike. Still, development is not linear; digital technologies enable “leap-frogging” and thus hold enormous potential to solve water challenges and achieve SDG 6. Yet this digital transformation will not come on its own. Digital water technology adoption requires the engagement and commitment of incumbents, start-ups and entrants from other sectors. These diverse stakeholder groups are now converging in the water sector to scale digital solutions to catalyse the adoption of water solutions through partnerships such as Techstars and the Nature Conservancy and platforms such as 101010.org. However, it is important to recognise that the integration of disparate systems, potentially creates ‘gaps in the wall’ that allows hackers to breach the security of our water systems. Hence it is imperative that for innovative digital technology entrepreneurs to succeed, security aspects are “baked in” from the start with systematic management of risks to mitigate operational network disruption risks and ‘softer’ business network risks (theft or loss of data and damage to internal business systems). Water utility leaders may have grown comfortable, even complacent with analogue systems and the idea of stationarity. But IWA believes our sector faces a stark choice: resist the rise of digital solutions, or embrace them in collaboration with innovators to unlock a new era of “water abundance.” In recognition of such potential, IWA has prepared a position paper with Xylem to present to delegates at the launch of a Digital Water initiative in Tokyo at the September 2018 World Water Congress. Change is always hard. Yet in response to new risks, emerging tools and rising stakeholder expectations, the emerging digital water utility offers the promise of fuelling sustained economic development, business growth and well-being for human and natural communities. The soft path to abundance just takes new thinking. For all the power harnessed by digital technology, no water innovation holds more latent potential than the open human mind.